A few people have asked how we take along everything we show up with. Here’s the quick and short version. That’s us getting gas for the Star. What you’re seeing is the Dutch Star, two mountain bikes, the Jeep and the TW200. Let’s start from the front. 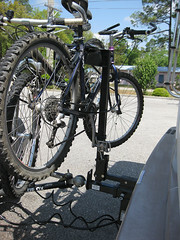 That’s the basic setup for the Jeep and bicycles. The whole contraption starts with a Blue Ox 10″ receiver lift. Welded on the top of that is a 1-inch receiver tube, which holds the Mopar bike rack. The next bit of gadgetry is the Blue Ox BX7445 Aventa LX Tow Bar . That goes into the Blue Ox riser and then attaches to the front of the Jeep. We generally keep that covered with a Blue Ox Cover when we’re parked and we lock the whole assembly together using a Blue Ox 4-lock kit. 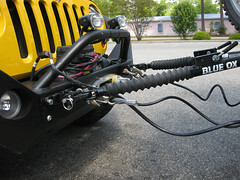 The Jeep has a Rock Hard bumper with tow brackets bolted through the bumper into the front frame. The safety cables attach to the D-Rings and the other cable is what handles all the lights. 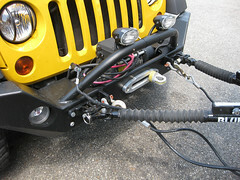 It’s a Mopar RV tow kit for the JK Wranglers (it’s a major pain to install, have a dealer do it). That takes care of the Jeep and the bicycles, so let’s move on to the TW200. 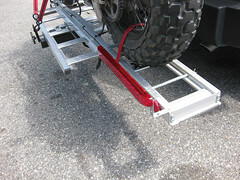 The hitch rack is a HaulMaster motorcycle hitch rack. It’s cheap and can generally be found at Harbor Freight. I’d rather have a MotoTote, but the TW only weighs about 300 and the HaulMaster is doing a decent job so far. It takes a lot of straps to keep the TW from wobbling around or stressing the handlebars too much. 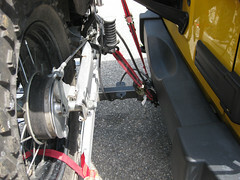 There are strap locations on the hitch bar, but I prefer to strap to the safety chain loops on the Jeep. If something catastrophic does happen to the rack, at least the TeeDub is attached to the Jeep and won’t go sailing down the highway into a truck or smthng. The one major fix I had to engineer for the rack is the lights. We actually got pulled over in Key Largo because the TeeDub blocks the view of the taillights on the Jeep. I added these with some aluminum angle brackets and wired up a four pin trailer connector to plug into the Jeep. This works fine and makes us WAY more visible to people behind us. 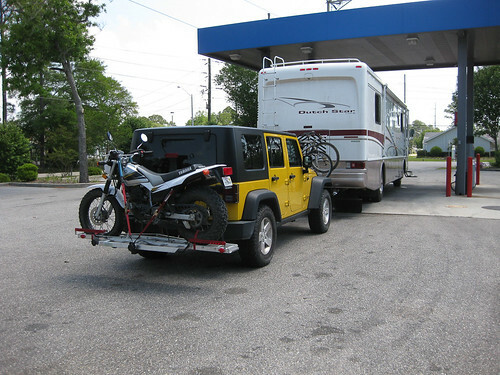 That’s the basic setup for our towing ensemble… If you want to know anything more specific, feel free to ask. Note: Product links are to Amazon and I get a small percentage kickback if you order anything using my links. Ok this is EXACTLY what I’m thinking of doing with my new RV but was really worried about all that weight on the back of my 2007 JKU 4dr. So there isn’t a sway issue or anything like that with the front end of the jeep being “lighter” with all that weight hanging off the back? 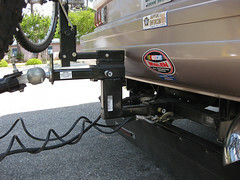 Does your 350lb rated hitch seem to do ok? How does the jeep do driving (once disconnected from RV) and hauling the TW around? Any issues there or squirrly driving? I’m so glad I found this blog article… again, exactly the setup I’m considering and great to see a real world setup. James, the weight wasn’t an issue at all. A 4dr JK should be easily able to carry that, mine had no issues at all. However, the tongue weight was one of the reasons I picked that bike… My KLR would have probably been a bit much for it. If you’re towing a light bike, it should be fine. A couple things that helped… The rack “clamped” onto the receiver with a 5/8″ bolt. This helped reduce a bunch of the “wobble” in the rack. I probably wouldn’t want a rack without that. Also, a JK is fairly high and getting the bike up there every time took some effort. Don’t attempt if you’re not willing to hold the thing up when it wants to fall over on you. Prepare to add lights to it if your bike blocks the brake lights (it probably will). We got pulled over in Florida for that. Fortunately, you should be able to get a very basic trailer light kit, screw it on and plug it in to the existing trailer harness on the Jeep. Finally, it’s not real visible in the pictures, but you’re not doing that with a spare tire attached to the tailgate. Ours was inside and had a cover on it. Funny I was just looking closer at pics to see if you had the spare on. I figured I’d have to remove the spare due to size/spacing, and weight. Well this is great news because I hadn’t found anyone with this very specific setup and really needed some insight. 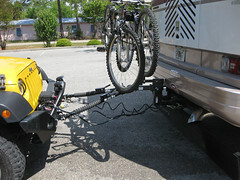 Even down to using a dual hitch off the RV to load my bike rack with two bikes. 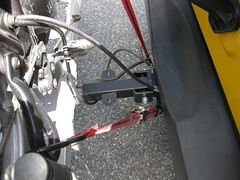 I’ve seen those hitch clamps and agree it is a good idea. My thule bike rack on the back of my jeep wobbles like crazy and drives me nuts. I definitely wouldn’t want a 300lb dirt bike doing that. Thanks again for the insight. So glad I found you and helping to ease my mind with this “Crazy” setup I had imagined.